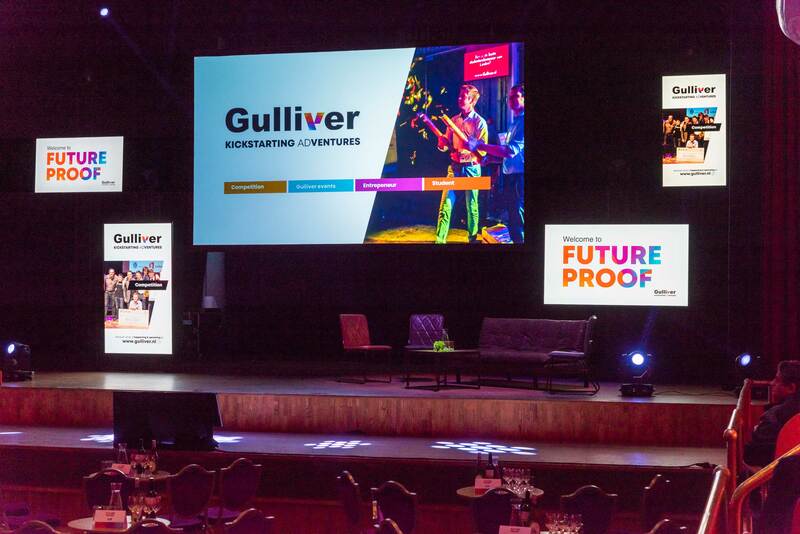 On the 7th of November, we celebrated sustainable entrepreneurship during Gulliver’s first edition of Futureproof. Our chairman Arash Aazami took off with an inspiring keynote about new energy models. One of the important messages he gave us: alternative sources of energy are not that alternative at all. We have been using wind and water power way longer than we have been using fossil fuels. Furthermore, Arash took us into a new concept he is working on with his company Kamangir: the internet of energy. From energy, Nupur Kohli brought us to sustainable healthcare and stress prevention. She showed the pillars that are needed for a sustainable health system. To become a futureproof society, we also need a sustainable way to produce food. Gertjan Meeuws’ message was clear: ‘plants don’t like nature’. He is convinced that seeds can reach their full potential if we treat them with the right light conditions. His indoor farming company Seven steps to heaven is promising, and requires way less space than traditional farming. Indoor farming increases food production capacity, and at the same time we can ‘give nature back to nature’. After the break André Kuipers showed how he saw our planet from up in space. Especially the global challenges become really clear if you see them from such a distance. Furthermore, he acknowledged that space travel to see global challenges is an ambivalent business, but it also brought forward many new innovations that we could never have created without. The last keynote was given by Thomas Rau. Rau is fighting for new business models which is reflected in his slogan ‘the end of property’. For instance, we do no longer have to buy lamp bulbs, we buy light. He is convinced that these models increase producer responsibility. Madaster is one of his other initiatives. Madaster is a platform to document the material that go into a construction site. That enables the reuse of those materials after the construction becomes obsolete. In conclusion, a very inspiring evening of which we hope to organize many more.